But the Boeing Co. 737 Max wasn't about to stall. Instead, a computer was getting erroneous readings from a sensor mounted like a weather vane on the jet's nose. The malfunction triggered an anti-stall feature that forced the plane into a dive - the same system that was implicated in a crash less than five months before in Indonesia that killed 189 people. "The thrust was full bore the whole way," said Roger Cox, a former accident investigator at the National Transportation Safety Board, who flew earlier models of the 737 while working as an airline pilot. "That is extremely curious." Ethiopian Transport Minister Dagmawit Moges said in a press conference Thursday that the pilots followed proper procedures issued after the October crash of a Lion Air jet. She recommended that Boeing review its flight-control system. Aviation authorities should verify that the issues have been adequately addressed "before the release of the aircraft to operations," she said. In an interview with CNN on Thursday, Ethiopian Airlines Chief Executive Officer Tewolde Gebremariam defended the pilots, saying the report proved the crew of EA 302 did more than what they were expected to do. "Today was a day for us to prove wrong all the speculators with false allegations," he said, adding that the airline will remain partners with Boeing. Ethiopian safety officials stopped short of saying the plane needs a redesign. That helped boost Boeing's shares 2.9 percent to $395.86 at the close in New York, paring the decline since last month's crash to 6.3 percent. Still, the two disasters in five months have pushed Boeing into one of the biggest crises in its century-long history. The crash in Ethiopia resulted in the worldwide grounding of the 737 Max, the revamped version of a plane model that accounts for a third of Boeing's operating profit. The accidents also prompted multiple investigations and reviews - including a criminal probe led by the U.S. Justice Department - of how U.S. regulators certified the flawed anti-stall system, known as MCAS. "We at Boeing are sorry for the lives lost in the recent 737 Max accidents," CEO Dennis Muilenburg said in a video. The Chicago-based planemaker blamed the accident on "a chain of events" and acknowledged the sensor malfunction. 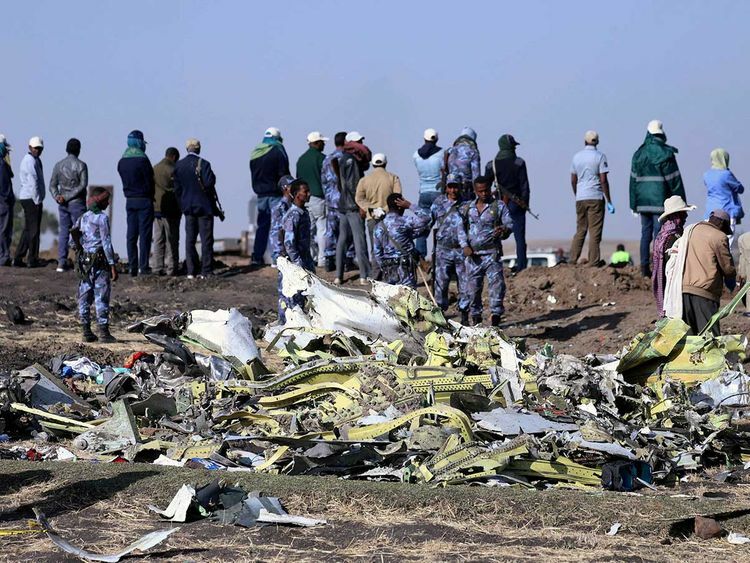 At near-maximum thrust, the plane became more difficult to fly, multiplying the problems created by the flaw in the 737 Max's software, according to pilots who reviewed a preliminary report issued Thursday by Ethiopia's Aircraft Accident Investigation Bureau. High speed also made it impossible to recover in the final seconds when the plane's nose pointed downward into their final, high-speed dive. "They exacerbated it," said Jeffrey Guzzetti, the former director of the FAA's Accident Investigation Division. Sensors in the aircraft that report how high its nose is pointed relative to oncoming air varied by almost 60 degrees. One of the "angle-of-attack" gauges read 15.3 degrees, likely an accurate reading for a plane taking off. The other erroneously read 74.5 degrees - which would suggest a plane pointing almost straight skyward. "As pilots have told us, erroneous activation of the MCAS function can add to what is already a high workload environment," Muilenburg said in his statement. "It's our responsibility to eliminate this risk. We own it and we know how to do it." "Everyone can talk about it from a desk, but when you see it happening it's another thing," said Dennis Tajer, a spokesman for the Allied Pilots Association at American Airlines. "What steps were taken, what steps were missed? Those are all things we're going to be looking at for several weeks." "Boeing may have to pay about $1 billion to settle the multiple wrongful-death lawsuits filed against it on behalf of victims of the Lion Air and Ethiopian Airlines 737 Max 8 crashes." -Holly Froum, BI litigation analystClick here to view the research. Pilots interviewed by Bloomberg didn't agree completely about the factors. Some took issue with Ethiopia's transport minister, saying the Ethiopian Airlines pilots had actually failed to properly follow the procedures. Other pilots said the flight crew's actions were understandable given the chaotic situation. However, at the high speed at which they were flying, it became much harder to adjust the plane's pitch manually, said John Cox, president of Safety Operating Systems and a former airline pilot. During that time, the captain asked the copilot to try making adjustments - known as trimming - manually. "The first officer replied that it is not working," according to the report. The two wheels that pilots turn by hand to trim would have been "very hard to move or impossible" at that speed, John Cox said. While it's not clear from the report exactly what steps the pilots took, their struggles to keep the plane climbing apparently led them to switch power back on to the trim system. About 30 seconds before they crashed, it was activated by the pilots to slightly raise the nose. Five seconds later, MCAS engaged again, once more pushing down the nose. At that speed, they couldn't overcome the dive using their control column alone, according to John Cox and Guzzetti. For reasons that haven't been explained, they didn't try to also trim the plane using switches on their control yokes. "You can't read the transcript and not put yourself in the cockpit," Tajer, of the Allied Pilots Association, said. "Every honest pilot says, I could see me right there, doing that, even if it was not a good thing, or saying, yeah that makes sense."